In 2010, a French scientist said that the clouds may have been ejected from a collision that formed the Andromeda Galaxy six billion years ago. 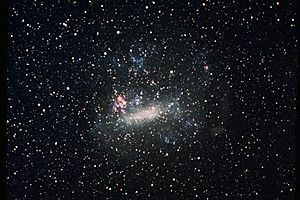 However most astronomers believe the Magellanic Clouds were made in the same process that formed our Milky Way Galaxy. ALMA antennae bathed in red light. In the background there is the southern Milky Way on the left and the Magellanic Clouds at the top. 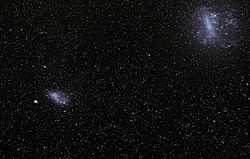 Magellanic Clouds Facts for Kids. Kiddle Encyclopedia.